How and What Spatial Diversity Antenna Systems in GSM, spatial antenna diversity configurations, horizontally separated antenna system, diversity. The spatial diversity antenna system is constructed by physically separating two receiving base station antennas. Here I write on spatial diversity antenna system criteria, configuration. Once they are separated far enough, both antennas receive independent fading signals. As a result, the signals captured by the antennas are most likely uncorrelated. The further apart are the antennas, the more likely that the signals are uncorrelated. The physical limitation of the supporting structure should also be considered while selecting the spatial diversity antenna configuration. 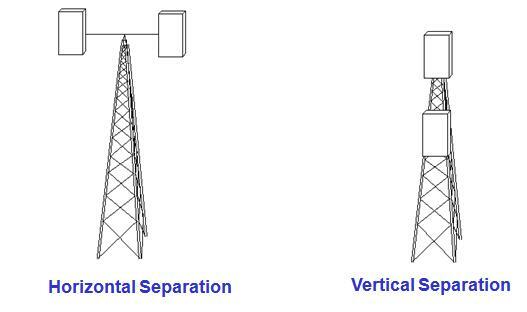 For example, if a wide framework is not permitted on top of a mounting tower, vertical separation is an alternative to be considered. To achieve the required correlation coefficient (r £0.7) different configurations require different separations. The separation indicated in Table below shows that low values of correlation are more easily obtained with horizontal rather than vertical separation. 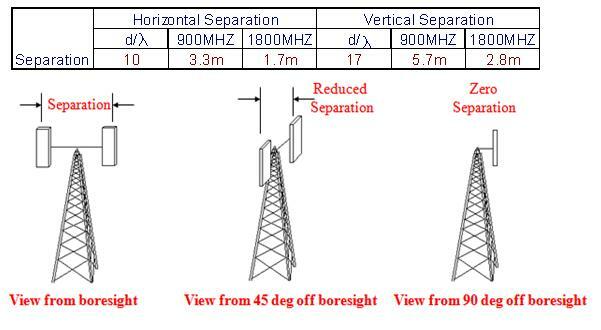 That is why most of the diversity antenna systems in GSM networks use horizontal separation. 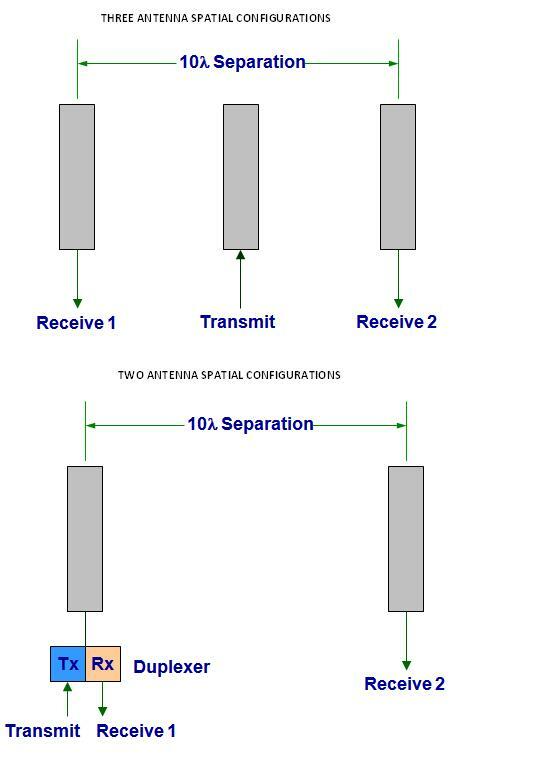 A system using horizontally separated diversity antennas has a symmetrical configuration and is therefore able to provide balanced signal strengths. A system using vertically separated antennas needs large separation to meet the required correlation. The consequence is that the two antennas have different antenna height gains, which may result in imbalance between the two signal strengths. Angular dependence reflects the dependence of the performance of a diversity antenna system on the angular position of a mobile relative to the boresight of the antenna. Horizontally separated antenna system has high dependence on the mobile’s angular position. The effective separation reduces as the mobile moves away from the antenna boresight. As the mobile is 90° off the antenna boresight, the effective separation becomes zero. In such a case, the signals from two antennas are very likely coherent which will then lead to a deterioration of the diversity performance. Most of the GSM cell sites are 3 sectored cell sites. The maximum angular offset is therefore approximately 60°. Simulation shows that the performance of a horizontally separated antenna system experiences noticeable deterioration only when the angular offset exceeds 70°. Easier to achieve low values of correlation and balance between the signals. Hence widely used. High angular dependence. The impact is however marginal for sectorised applications. Require sizable head frame on the supporting structure. Require large separation for low values of correlation. May cause imbalance between the two diversity branches.